Background : Contrast MRA (C-MRA) is the standard for quantitative analysis of thoracic vessels. We evaluated a noncontrast MRA (NC-MRA) sequence (3-D EKG and navigator-gated SSFP) for quantitative evaluation of the thoracic aorta and branch pulmonary arteries in young patients with congenital heart disease. Objective : To compare contrast and noncontrast magnetic resonance angiography for quantitative analysis of thoracic arteries in young patients with congenital heart defects. Methods : Measurements of thoracic aorta and branch pulmonary arteries were obtained from C-MRA and NC-MRA images in 51 patients, ages 2-35 years. Vessel diameters were compared using correlation and Bland-Altman analysis. Interobserver variability was assessed using percent variation. Results : C-MRA and NC-MRA measurements were highly correlated (r = 0.91-0.98) except for the right pulmonary artery (r = 0.74, 0.78). Agreement of measurements was excellent (mean difference -0.07 to -0.53 mm; mean % difference -1.8 to -4.9%) except for the right pulmonary artery which was less good (mean difference 0.73, -1.38 mm; -3, -10%). Interobserver variability ranged from 5% to 8% for aortic and from 10% to 16% for pulmonary artery measures. The worse agreement and greater variability of the pulmonary artery measures appears due to difficulty standardizing the measurements in patients with abnormal and irregular vessels. Conclusion : These data indicate that C-MRA and NC-MRA measures are comparable and could be used interchangeably, avoiding administration of contrast in selected patients. Contrast-enhanced magnetic resonance angiography (C-MRA) is generally accepted as the standard for display and analysis of thoracic vessels. This technology requires administration of a gadolinium-based contrast agent. These contrast agents have been associated with significant toxicity in a subset of patients. , In addition, C-MRA is usually performed with a prolonged breath hold that can be difficult for young patients or those with cardio-respiratory compromise. Finally, C-MRA prolongs the study time and might not be needed otherwise. Recently, new sequences have been described for MRA that do not require administration of contrast. Cardiac and navigator-gated 3D steady-state free-precession (SSFP) sequences, non-contrast MRA (NC-MRA), have been shown to provide excellent qualitative evaluation of the aorta,  the pulmonary arteries,  and the thoracic veins. However, quantitative evaluation has been limited to the thoracic aorta in adult patients with aortic disease. ,, We are aware of no quantitative comparisons in young patients with congenital heart defects, particularly involving the pulmonary arteries. We compared vessel measurements made from C-MRA and NC-MRA images to determine if the results are comparable and if NC-MRA can be substituted for and/or used interchangeably with C-MRA imaging in young patients with congenital heart defects. We reviewed the Cardiac Magnetic Resonance database at Bambino Gesω Pediatric Hospital and identified all patients imaged between September 2007 and September 2008 in whom both C-MRA and cardiac and navigator-gated 3D SSFP NC-MRA images had been obtained. Images were reviewed and patients in whom artifacts (e.g., from sternal wires, intravascular devices, etc.) precluded measurement of vessels or in whom the image quality was not considered diagnostic were excluded. The study was approved by the institutional review board. All MR examinations were performed using a 1.5 T magnet with phased array cardiac 5 channel coil (Achieva, Philips Medical, Best, The Netherlands). The 3D SSFP sequence was performed with the following parameters: field of view, depending on size of patient, from 280 mm (supero−inferior) Χ 169 mm (antero−posterior) Χ 77 (left−right) to 360 mm (superior−inferior) Χ 270 mm (anterior−posterior) Χ 160 mm (left−right), acquisition matrix 192 Χ 144, reconstruction matrix 384 Χ 384, 170 contiguous slices with slice thickness 0.89 mm, acquisition Voxel MPS (mm) 1.88 Χ 1.88 Χ 1.88 and reconstruction voxel 0.94 Χ 0.94 Χ 0.89, TE = 1.62 ms, TR = 3.2 ms, flip angle = 55Ί, turbo factor = 28, and sensitivity encoding (SENSE) = 2.2. The EKG gate was set to end-diastole. Prospective respiratory gating was performed using a navigator placed on the right diaphragm with a 5 mm displacement window. Magnetization preparation pulses included a T2 prepared pulse and a spectral fat-saturation inversion recovery pulse. Data acquisition was performed in sagittal orientation with a navigator acceptance rate of 30%−60% resulting in an imaging time for this sequence of 5−8 min. C-MRA was performed using a 3D FFE sequence in coronal or sagittal plane, in relation to the initial question of the exam. We used the following parameters: field of view, depending on the size of the patient, 270 mm (superior−inferior) x 162 mm (anterior−posterior) Χ 75 mm (left−right) to 410 mm (superior−inferior) Χ 410 mm (anterior−posterior) Χ 150 mm (left−right), acquisition matrix 400 Χ 204, reconstruction matrix 512 Χ 512, 100 slices (on average) with voxel size 0.88 mm Χ 0.88 mm Χ 1.5 mm, TE 1.38 ms, TR = 4.9 ms, flip angle = 40Ί, and SENSE = 2. The acquisition followed power injection of 0.2 mmol/kg of gadolinium contrast agent (magnetovist) at 1−2 ml/s and was obtained in two phases. MR data acquisition was started when the contrast arrived in the right or left ventricle depending on the exam question (pulmonary arteries or aortic arch). Patients were asked to hold their breath in inspiration during the acquisition. Three patients under 6 years of age were examined under general anesthesia. Mechanical ventilation was continued during the NC-MRA acquisition while the C-MRA was acquired with suspension of respiration for each phase. Measurements were made in MPR mode using commercially available software (Viewform, Philips Medical, Best, The Netherlands). The gray scale of the monitor was adjusted to avoid over saturation. The vessel to be measured was displayed in three mutually perpendicular planes. Two planes were aligned with the long axis of the vessel and the third was adjusted to provide a cross-section of the vessel. The two short-axis diameters of the vessel were then measured in standard anatomical axes. Measurements from C-MRA and NC-MRA images were made at different times to avoid recall bias. Measures were made independently by three observers, one experienced in image measurement, and two novices. The vessels measured were: ascending aorta where the measurement plane passed through the right pulmonary artery; descending aorta where the measurement plane passed through the dome of the left diaphragm; the right pulmonary artery where the measurement plane passed through the ascending aorta; the left pulmonary artery just before the first branch where the measurement plane passed through the descending aorta. Data are reported as mean ± SD. Measurements from the two imaging techniques were compared using correlation analysis and Bland-Altman analysis for each observer. Interobserver variability was calculated as mean percent variation. During the study period 125 exams were performed of which 51 met entry criteria. In 31 patients either the C-MRA or NC-MRA had not been performed. Remaining exclusions were primarily due to artifact from metallic devices such as stents, coils, and sternal wires. The congenital heart defects included tetralogy of Fallot (25%), aortic arch anomalies (22%), transposition of the great arteries (12%), bicuspid aortic valve (12%), various types of single ventricle after Fontan operation (8%), and various other defects (21%). The average age was 17±8 years (range 2−35 years). Comparisons of the 2 dimensions of the ascending aorta were possible in 49 patients, the descending aorta in 51 patients, the right pulmonary artery in 44 patients and the left pulmonary artery in 37 patients. Anatomic deformity of the vessel related to the underlying heart defect or prior surgery precluded a standardized measurement in the remaining patients. All measures from C-MRA and NC-MRA images were highly correlated (r > 0.9) except for right pulmonary artery dimensions [Table 1]. The mean differences between measures ranged from −0.07 to −1.38 mm or −1.8% to −10% [Table 2]. Bland Altman analysis showed a small but consistent bias toward larger dimensions from the C-MRA images, as indicated by the negative differences [Figure 1]. The correlation was significantly lower and the agreement worse for the measures of the pulmonary arteries, especially the right, compared with the aorta. This is most likely due to marked variability in the diameter along the length of the pulmonary vessels in these patients with congenital heart defects and difficulty in standardizing the location for the measurement. Inter-observer variability was low [Table 3], even for the less experienced operators. For aortic measurements the range was 5%−8% and for the pulmonary arteries 10%−18%. The greater variability for the pulmonary arteries was again likely due to difficulty standardizing the location of the measurement. We have shown that measurements of thoracic vessels made from NC-CMRA images are comparable to those made from C-CMRA images in young patients with congenital heart defects. The mean difference was less than 5% for all but the right pulmonary artery. Measurements from either source could be used interchangeably in the follow-up of patients with abnormalities of thoracic vessels, avoiding use of gadolinium contrast agents and the need for extended breath hold for many exams. The slightly larger diameter estimates obtained using C-MRA could be due to several factors. Artifact from low-velocity flow near the vessel wall could have falsely reduced the diameter measurements obtained using NC-MRA. Many patients were unable to fully cooperate with the breath-hold during C-MRA. Motion artifact could have falsely increased the dimensions measured using this technique. NC-MRA has been validated previously for qualitative evaluation of the thoracic aorta  and veins,  as well as the pulmonary arteries. Gebker et al, showed that NC-MRA (SSFP), C-MRA, and turbo spin echo yielded equivalent measurements of the thoracic aorta in adults with aortic disease. Francois et al, compared 3D SSFP and C-MRA for measurement of the thoracic aorta in adults with vascular disease and found, similar to our data, a nonsignificant trend toward smaller measurements using 3D SSFP. More recently Potthast et al, in a comparison of 3D SSFP, C-MRA and two 2D sequences for measurement of the thoracic aorta in adults, confirmed the equivalence of the 3D imaging techniques. These investigators found the 3D SSFP images to be sharper with better defined edges compared to C-MRA. NC-MRA has also been validated by comparison with computed tomography (CT) for quantitative evaluation of the aorta in a piglet model,  simulating use in infants and small children. Measurements from a 3D-SSFP sequence with EKG and navigator respiratory gating, similar to the sequence used in this study, were shown to correlate and agree closely with EKG-gated CT measurements. Our study extends these observations to young human subjects with congenital heart defects, using C-MRA as the standard. C-MRA has been shown to correlate closely with angiographic measurements of the aorta in patients with coarctation. 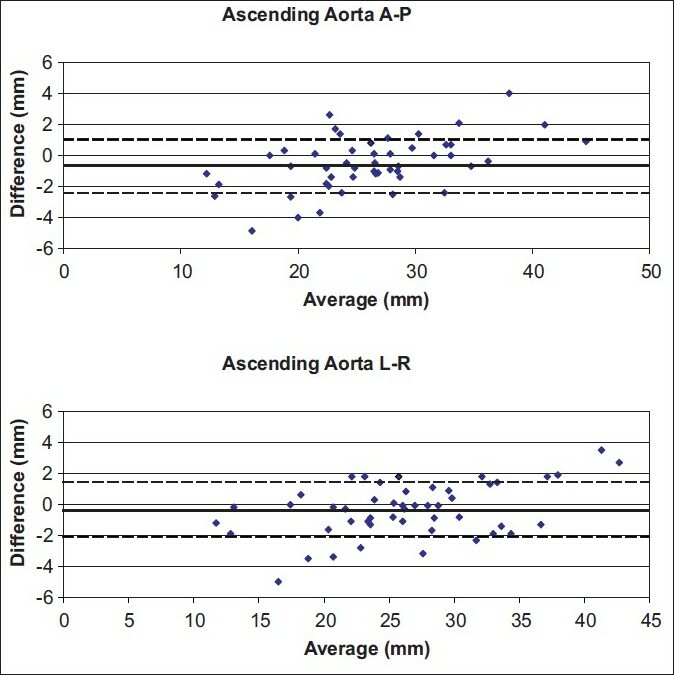 Recently normal aortic dimensions, measured from C-MRA images, were published for infants and children. These values could be used for measurements derived from NC-MRA images as well. One limitation of this study was the difficulty standardizing measurements of the pulmonary arteries, especially the right. The diameter of these vessels showed marked variation along the length of the vessel, as is often seen in patients with congenital heart disease. This illustrates a common problem for serial quantitative evaluation of many patients with vascular abnormalities and points out the need for direct comparison of images between exams to ensure comparability of measurements. We avoided direct comparison of C-MRA and NC-MRA images in this study to avoid recall bias. Other limitations include the retrospective nature of the study and exclusion of a large number of patients due to artifacts from metallic devices. However, metallic artifact is a frequent problem in patients after surgery for congenital heart defects. In conclusion, NC-MRA and C-MRA provide similar and comparable measures of the thoracic aorta and branch pulmonary arteries in young patients with congenital heart defects and could be used interchangeably in the follow-up. The low inter-observer variability, even for less experienced operators, indicates that reliable and consistent measurements can be performed from C-MRA and NC-MRA after a brief training period. 1. Broome DR, Girguis MS, Baron PW, Cottrell AC, Kjellin I, Kirk GA. Gadodiamide-associated nephrogenic systemic fibrosis: why radiologists should be concerned. AJR Am J Roentgenol 2007;188:586-92. 2. Sadowski EA, Bennett LK, Chan MR, Wentland AL, Garrett AL, Garrett RW, et al. Nephrogenic systemic fibrosis: risk factors and incident estimation. Radiology 2007;243:148-57. 3. Amano Y, Takahama K, Kumita S. Non-contrast-enhanced MR angiography of the thoracic aorta using cardiac and navigator-gated magnetization-prepared three-dimensional steady-state free precession. J Magn Reson Imaging 2008;27:504-9. 4. Geva T, Greil GF, Marshall AC, Landzberg M, Powell AJ. Gadolinium-enhanced 3-dimensional magnetic resonance angiography of pulmonary blood supply in patients with complex pulmonary stenosis or atresia: Comparison with x-ray angiography. Circulation. 2002;106:473-8. 5. Tomasian A, Lohan DG, Laub G, Singhal A, Finn JP, Krishnam MS. Noncontrast 3D steady state free precession magnetic resonance angiography of the thoracic central veins using nonselective radiofrequency excitation over a large field of view. Invest Radiol 2008;43:306-13. 6. Gebker R, Gomaa O, Schnackenburg B, Rebakowski J, Fleck E, Nagel E. Comparison of different MRI techniques for the assessment of thoracic aortic pathology: 3D contrast enhanced MR angiography, turbo spin echo and balanced steady state free precession. Int J Cardiovasc Imaging 2007;23:747-56. 7. François CJ, Tuite D, Deshpande V, Jerecic R, Weale P, Carr JC. Unenhanced MR angiography of the thoracic aorta: Initial clinical evaluation. AJR Am J Roentgenol 2008;190:902-6. 8. Potthast S, Mitsumori L, Stanescu LA, Richardson ML, Branch K, Dubinsky TJ, et al. Measuring aortic diameter with different MR techniques: Comparison of three-dimensional (3D) navigated steady-state free-precession (SSFP), 3D contrast-enhanced magnetic resonance angiography (CE-MRA), 2D T2 black blood, and 2D cine SSFP. J Magn Reson Imaging 2010;31:177-84. 9. Ley-Zaporozhan J, Kreitner KF, Unterhinninghofen R, Helm E, Puderbach M, Schenk JP, et al. Assessment of thoracic aortic dimensions in an experimental setting: comparison of different unenhanced magnetic resonance angiography techniques with electrocardiogram-gated computed tomography angiography for possible application in the pediatric population. Invest Radiol 2008;43:179-86. 10. Godart F, Labrot G, Devos P, McFadden E, Rey C, Beregi JP. Coarctation of the aorta: Comparison of aortic dimensions between conventional MR imaging, 3D MR angiography, and conventional angiography. Eur Radiol 2002;12:2034-9. 11. Kaiser T, Kellenberger CJ, Albisetti M, Bergsträsser E, Valsangiacomo Buechel ER. Normal values for aortic diameters in children and adolescents - assessment in vivo by contrast-enhanced CMR-angiography. J Cardiovasc Magn Reson 2008;10:56. Authors of Document Rogers, T., Ratnayaka, K., Lederman, R.J.
Madan, N. and Yau, J.L. and Srivastava, S. and Nielsen, J.C.
Vitanovski, D., Ralovich, K., Ionasec, R., (...), Hornegger, J., Comaniciu, D.